I got a call from my mom a couple of weeks telling me to avoid some sort of Loco drink because kids were dying from it. I hadn't even heard of it at the time, so I had to google it. The drink is Four Loko and they've made the headlines quite a bit these past couple of weeks - to the point where Mass is going to restrict their sale as of next week. 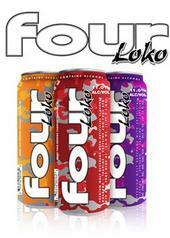 The Massachusetts Alcoholic Beverages Control Commission is restricting sales of popular stimulant-packed alcoholic drinks, including Four Loko that has been banned in four states.Commission head Kim Gainsboro said Monday that her agency will file an emergency regulation next Monday to control sales of caffeinated alcoholic drinks that are classified as malt beverages. The new rule will ban sales of malt beverages containing alcohol, caffeine or any other herbal or chemical stimulant.Its manufacturers would be required to relabel and repackage the drinks in resealable containers. The drinks also would no longer be sold by vendors selling wine and malt beverages. I think the closest I've ever come to something like that was probably 5 years ago. I bought a pack of some caffeinated Budweiser beer that had ginseng in it for a friends bbq. I had one can and it was awful. Oh, and then there's always the occasional Red Bull & vodka, jaeger bomb, etc. 0 Response to "MA Restricting Stimulant Alcoholic Beverages"